Since Jerry Brown began his second two terms as California governor in January 2011, he has continually promoted himself as a “climate leader” and “green governor” at climate conferences and photo opportunities throughout the U.S. and the world. 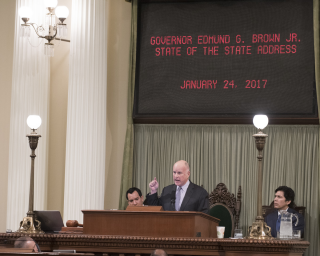 The mainstream media and some "alternative" media have provided overwhelmingly fawning coverage of Governor Brown's environmental record, usually without conducting any real investigation into Brown's actual record. Countering this false narrative of the "green" governor, twelve public interest groups, led by Consumer Watchdog and Food & Water Watch, will on Monday, February 6, at 11 a.m. unveil a comprehensive report card on Jerry Brown Administration’s environmental record showing he falls short in seven key areas, including fossil fuel generated electricity, oil drilling, and coastal protection. The groups will hold a live press conference at the Consumer Watchdog offices at 2701 Ocean Park Blvd., Suite 112, Santa Monica, CA 90405 on February 6 at 11 am. Visuals will include blowups of Brown’s scores on seven key environmental indicators, graphs on state fossil fuel generating capacity, oil drilling, and polluting oil wastewater. There were also be conference call-in line available for those not able to attend the conference. "The groups will call for a moratorium on the building of natural gas powered electricity plants, given the glut of electric capacity and call for an outside audit of state’s energy needs," according to a media advisory from Consumer Watchdog and Food & Water Watch. "The groups will show how California can improve its environmental protections to meet standards set in other states. Residents of Porter Ranch will discuss their deteriorating health due to Brown's push to keep Aliso canyon's gas reserve open."